Does Christmas shopping start earlier every year? Nope. The long history of early bird shopping in America. Christmas Season Starts Earlier Every Year! Actually it’s been starting in early autumn since the Victorian era. 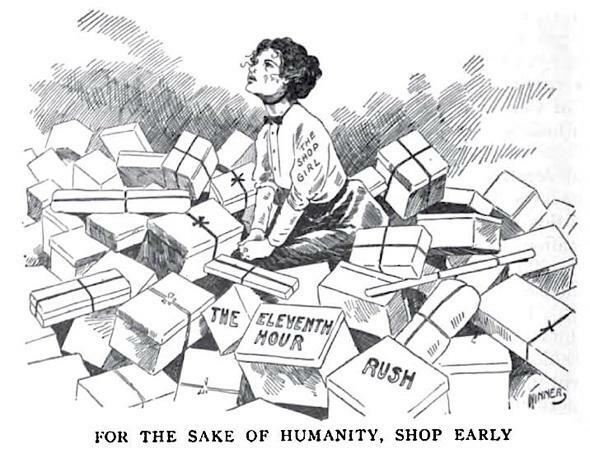 The “Shop Early Campaign” by early 20th century progressives aimed to improve conditions for overworked clerks. But here’s the catch: This ad ran in 1912. 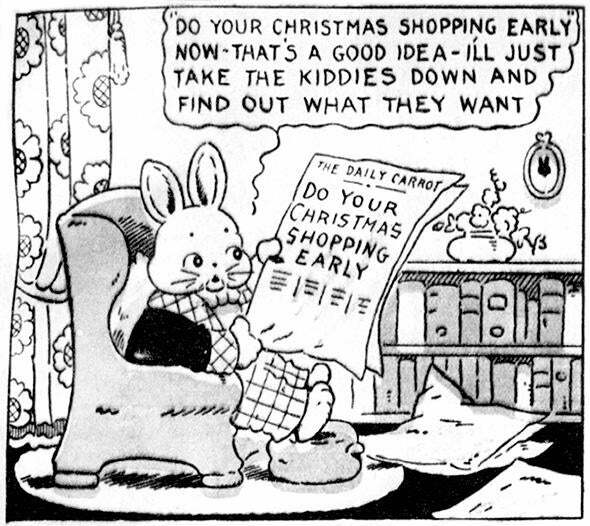 The gripe about Christmas coming “earlier every year” is a hardy media perennial across decades and borders, as British complaints in 1954 and American ones in 1968 about September Santas attest. But the practice of pushing early shopping is much older—older, even, than that 1912 ad—and the blame goes to everyone from retailers to rabble-rousers to the U.S. government. An 1885 ad in South Carolina urges early Christmas shopping, an idea novel enough that it needed explaining. Early shopping might have faded into history like other Gilded Age excesses were it not for the arrival of an utterly counterintuitive player into our story: progressive titan Florence Kelley. Better known today as a co-founder of the NAACP—and for teaming up with Upton Sinclair and Jack London to start the Intercollegiate Socialist Society—Kelley also has a special place under the historian’s Christmas tree. Her widely distributed 1903 essay, “The Travesty of Christmas,” was not, as you might expect from a socialist suffragette, an attack on early shopping—it was in support of it. Kelley’s mass movement, the National Consumers League, turned their “Shop Early Campaign” into a progressive juggernaut over the next decade: Tens of thousands of posters were distributed in cities each year to halt “the inhuman nature of the eleventh-hour rush” on sales clerks. 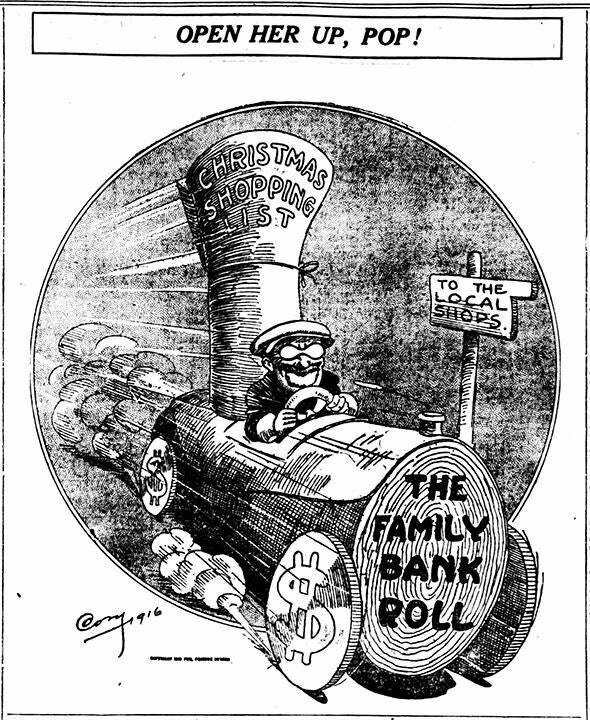 Cities were annually plastered with “Do Your Christmas Shopping Early” signs—“they are everywhere,” a wire service reported from New York City in 1913. Savvy merchants were quick to adopt the Shop Early Campaign, which made for strange bedfellows: Shop Early was promoted by retail clerk unions and the U.S. Chamber of Commerce alike. And as ever, a few retailers were ready to push beyond even these new boundaries of good taste. One 1914 Hoosier Cabinet ad coyly appealed to American wives: “Just Wink your Christmas eye at Mr. Husband and say ‘Hoosier.’ ” The ad ran in August. 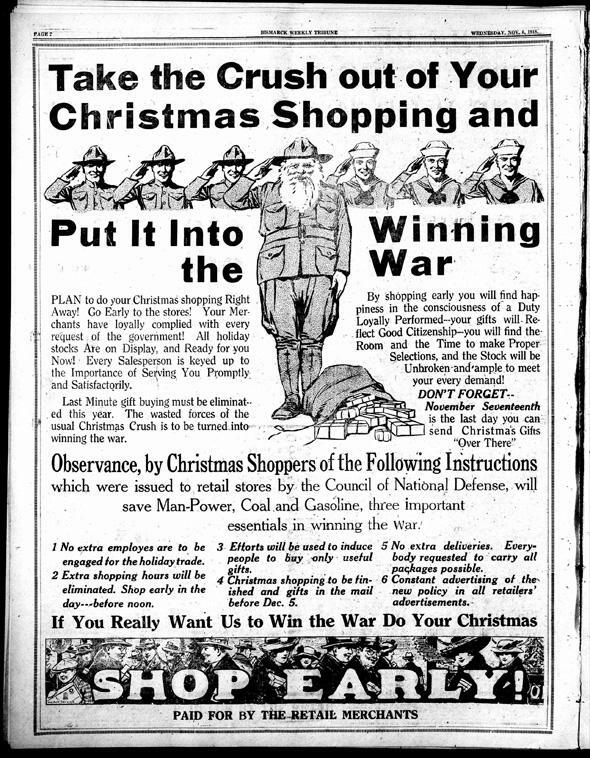 Retailers’ fondness for early shopping meant that these efforts were kept up after the war, too. One Albuquerque, N.M., retailer in 1920 demanded, with unanswerable logic, “If Christmas Came Tomorrow, Would You Be Ready?” Americans were: Shop Early drives roared through the 1920s and 1930s, and the Washington Times even held prize contests for schoolchildren to write 100-word essays on “Why Everybody Should Do Their Christmas Shopping Early.” The notion continued making wartime surges, with the postmaster general urging Americans in August 1943 to shop “really early, indeed right now”—a situation revisited in the Vietnam War. By then, early Christmas shopping had fermented into the potent historical brew of idealism, patriotism, and sheer retail gluttony that we know today. Uneasiness over November shopping and outright ire over September and October sales are now some of America’s oldest Yuletide traditions. Like the annual unwrapping of a fruitcake or an ugly sweater, the idea that Christmas “comes earlier every year” is entirely predictable, bound by tradition—and yet somehow always surprising to us.